Just a month after their grand opening, business is going well at StuffedWing. 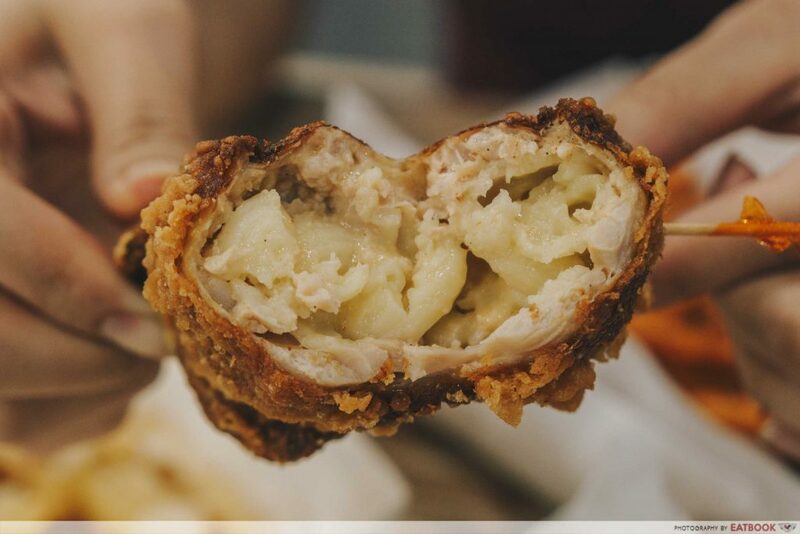 Just like its name suggests, StuffedWing offers boneless chicken wings that are stuffed with various fillings, including nasi lemak and mac and cheese. 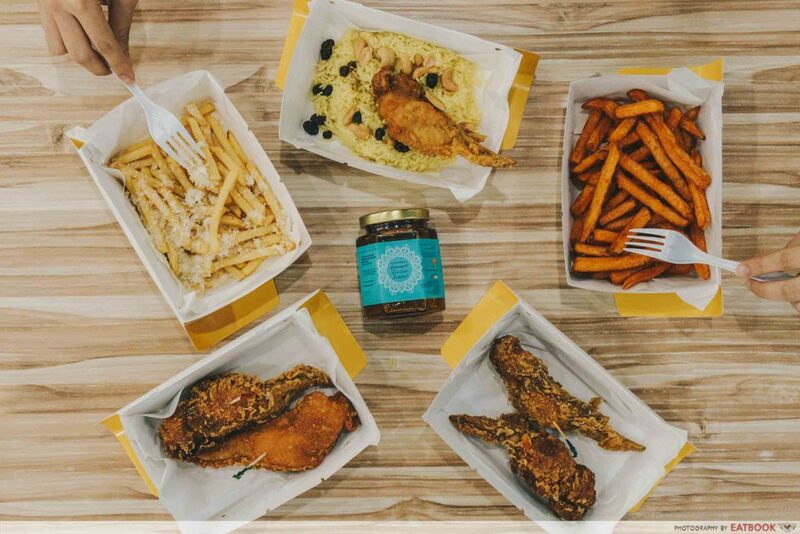 The stall is owned by three partners who come from different backgrounds – one specialising in information technology, one in food trading and the other in food catering. 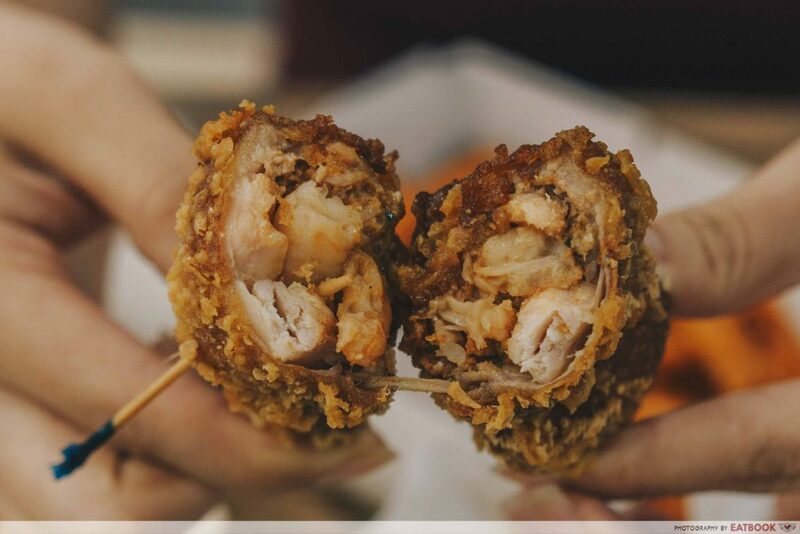 Bruce, one of the owners, is envious of the fact that other countries have their own signature street food and starting StuffedWing to offer stuffed, boneless chicken wings with local flavours to Singaporeans. The wings in general were not too oily, and the batter was light and crispy. Signature Nonya Curry was packed with flavour; the curry aroma was prominent and reminded me of the flavours in a good ol’ curry puff. All the stuffed wings go at $3.80 per piece, and $6.80 with a side. Next, I went for the Signature Nasi Lemak. 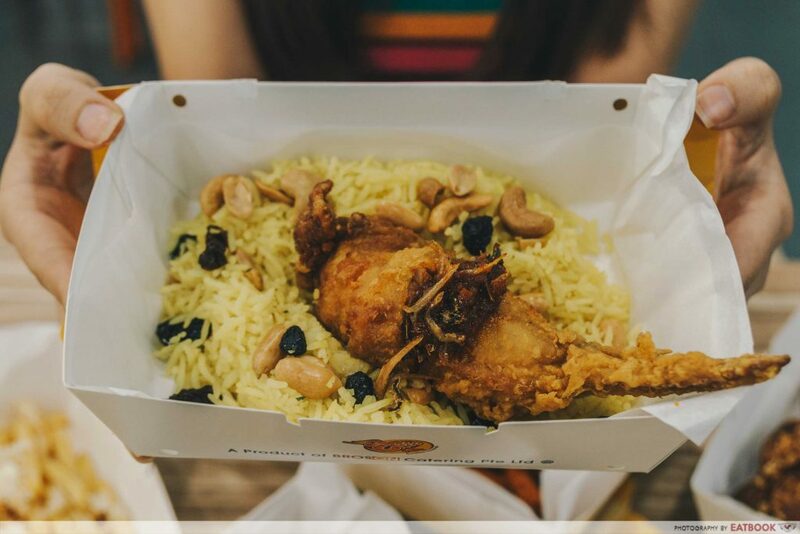 At first glance, I was pretty skeptical as it looked as if the rice-to-chicken ratio was imbalanced, with the rice taking up most part of the wing. Biting into it, the rice itself was not too mushy and had a tinge of coconut flavour. I highly recommend adding their sambal chilli with peanuts and ikan bilis. 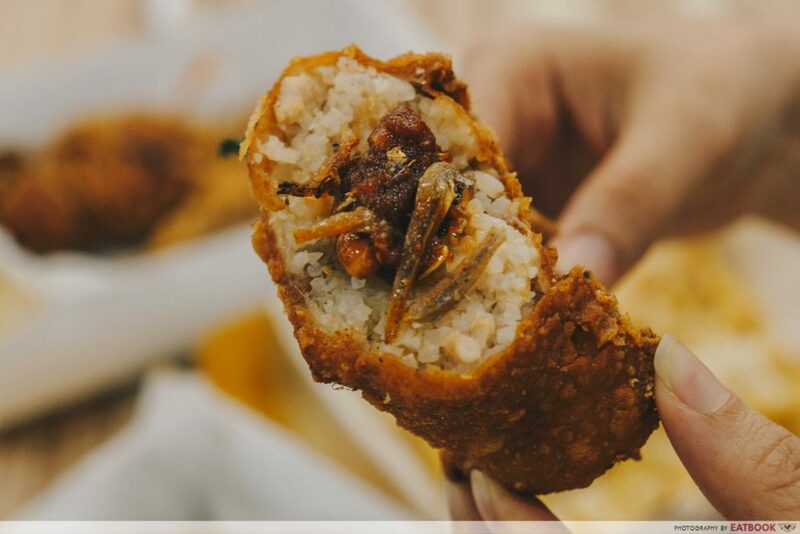 The spicy and slightly sweet chilli brought out the lemak goodness of the rice and the familiar taste of nasi lemak. The peanuts and ikan bilis added crunch to the whole dish. As a lover of anything related to salted egg yolk, I was excited to try their Signature Salted Egg Yolk Prawn. Tearing into it, I found chunks of prawn, but I was a little disappointed as I was left searching for the aroma of salted egg. 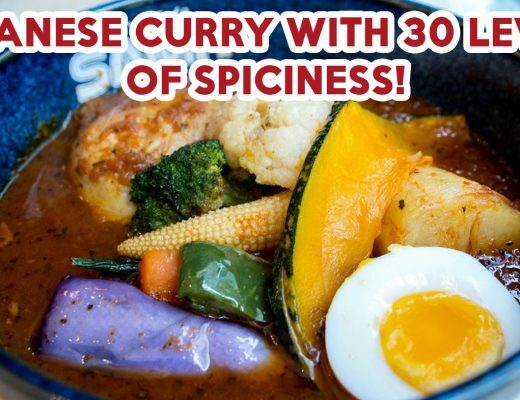 There was a familiar grainy, oily texture upon bite that went well with the ingredients, but that was not paired with a strong salted egg flavour. The Signature Mac & Cheese was underwhelming. There was a slight cheese taste, but the overcooked macaroni left the dish mushy and flat. The texture just reminded me of a cheese potato croquette. Finally, I went for their new Butter Rice Set ($5.90) that includes rice and an Original Chicken ($2.90 for a la carte). Get this if you’re looking for a more substantial meal. 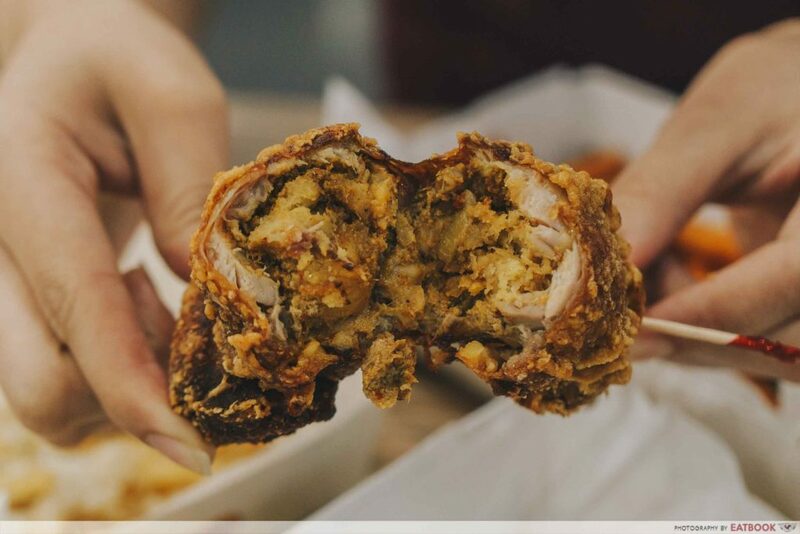 The Original Chicken is the most affordable stuffed chicken wing on the menu. 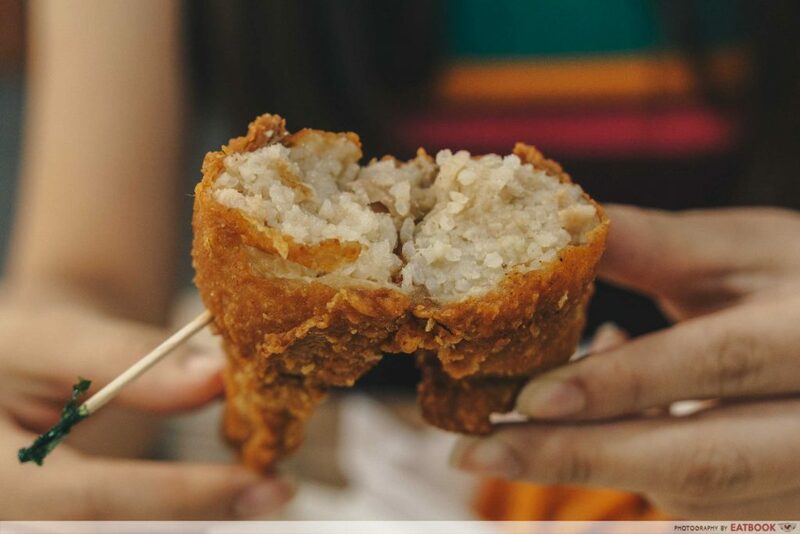 The stuffing is inspired by har gao and siew mai, and mimics the familiar taste of Chinese dim sum. 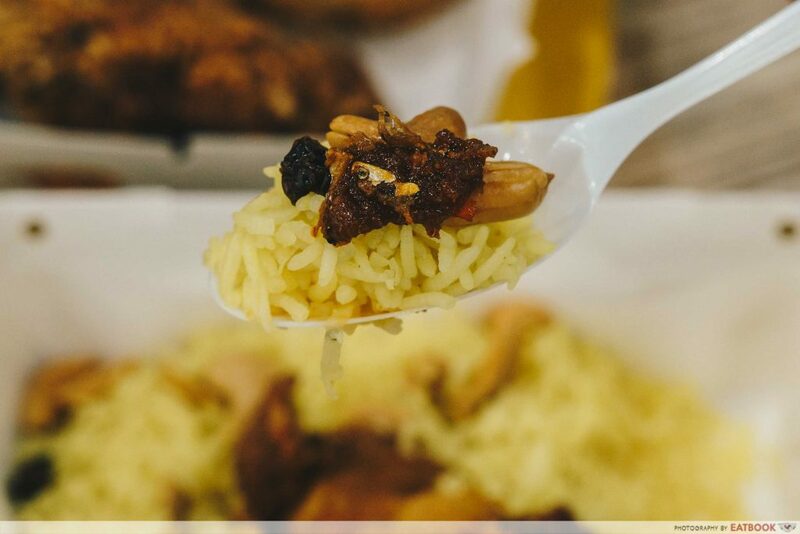 The basmati rice is mixed with roasted cashews and raisins. The rice had a good bite, and the cashews and raisins provided crunch and sweetness to the dish. Adding the punchy sambal elevates the dish with a spicy kick. If you cannot decide on a side to go with your stuffed wings, I recommend some Sweet Potato Fries. You can choose to get them a la carte at $3.50 or order this as a set with your wing. 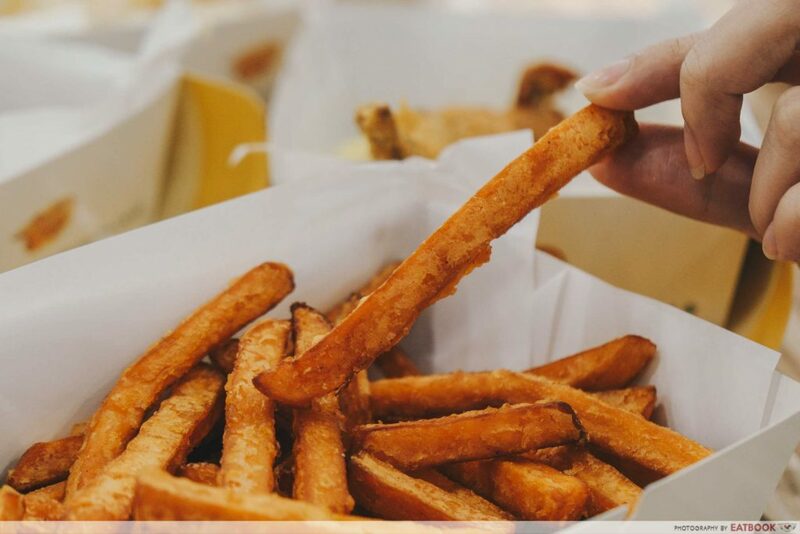 These thick sweet potato fries were crispy on the outside and soft and sweet on the inside – sure to leave your fingers reaching for more. 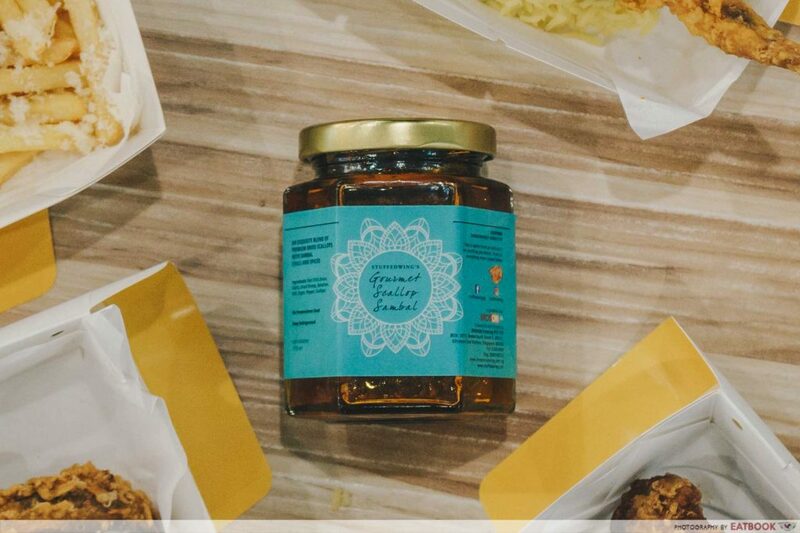 StuffedWing also produces their own Gourmet Scallop Sambal that goes at $5 per jar. The sambal was rich and flavourful – $5 for this jar is pretty bang for your buck! 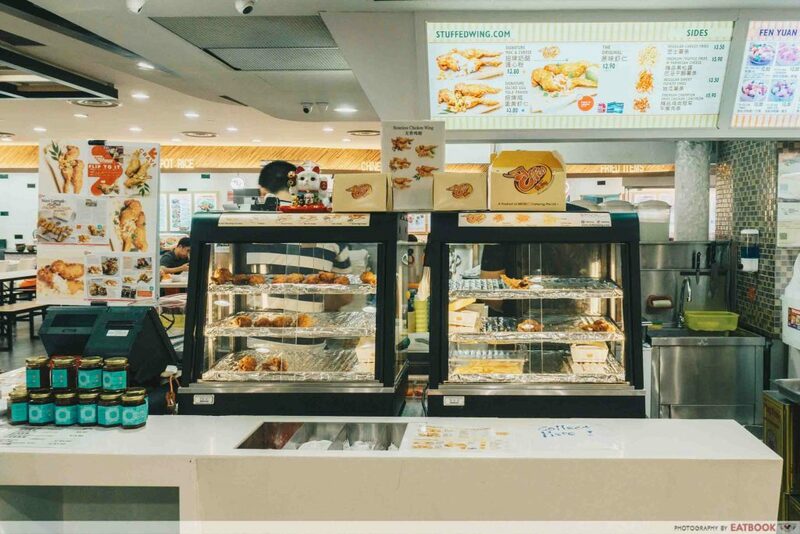 StuffedWing is located in the middle of Tampines Mall’s Kopitiam on level four. 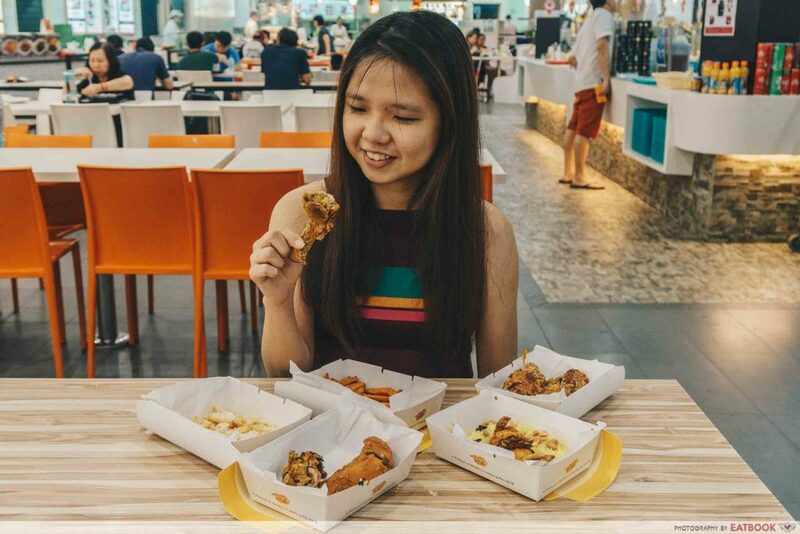 Even if you are not going down specifically to try their stuffed wings, you’ll surely be tempted to get one if you’re queueing up for dessert right next to it. The area is spacious and brightly lit, with clean tables and seats. The entire area is fully air-conditioned and has plenty of seats. 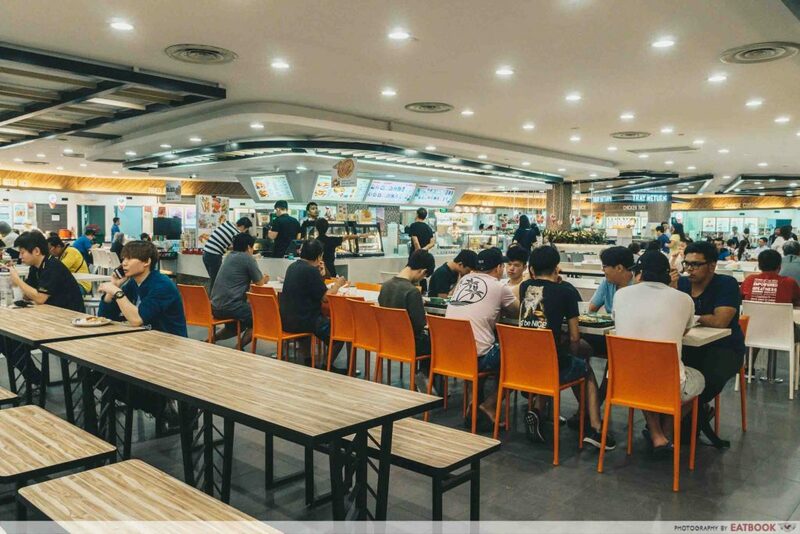 The owners warned that it can get pretty packed during lunch and dinner hours. There is just something enticing and addictive about chicken wings that draws people in, especially when paired with local flavours. Overall, the meal here was truly something different. I never had a boneless chicken wing before, let alone one that is stuffed with familiar flavours. Head to StuffedWing for a try if you happen to be in the area! 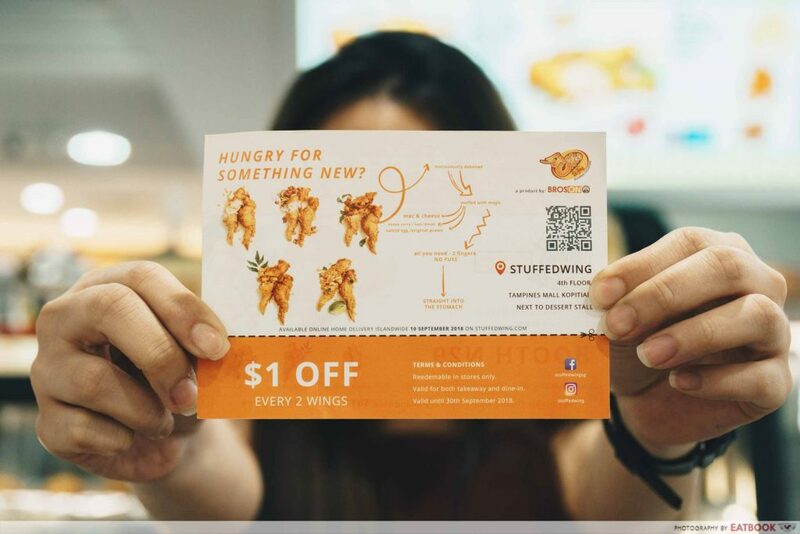 For the entire month of September, StuffedWing is having a promotion of $1 off every two wings of any flavour. 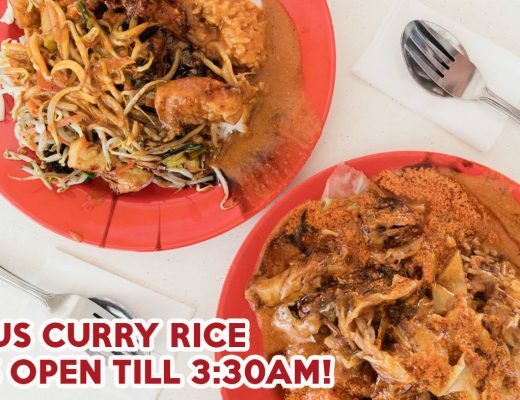 This month, mee siam will also be added to the menu for those who prefer a noodle option over rice with fried chicken. The owners are thinking of introducing stuffed spring chickens too. Keep a lookout for more new updates on their Facebook page! 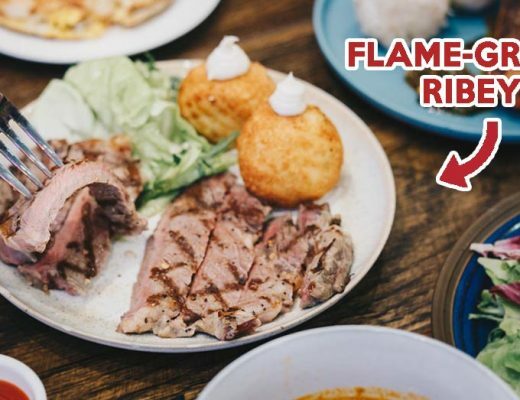 Check out more unique chicken wing flavours or these Tampines food places as well! StuffedWing is currently in the process of getting halal certification. This was a media tasting at StuffedWing.